Although the East vs. West homecoming game is still one day away, East football can already claim dominance in one category: injuries. 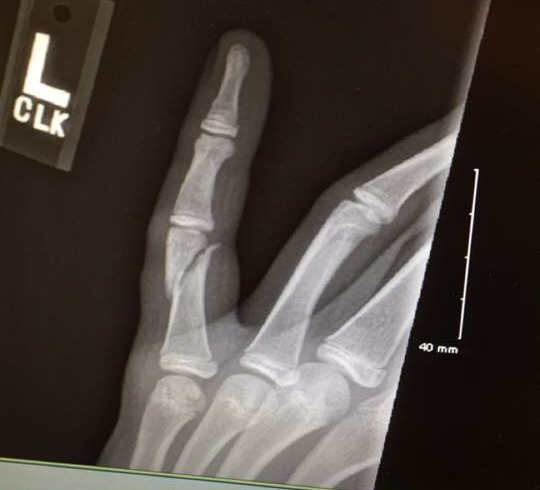 “I would cut it off if I had to,” said Jason Myrick, an East junior who broke his left pinky finger in a varsity football game against Slinger on Sept. 25. Myrick sustained a complete through and through fracture on his left pinky finger one week before the beloved homecoming game. Myrick will get pins placed in his finger on Monday to correct the break. East junior Tony Spence suffered a collarbone fracture while tackling during practice. “When I hit the ground I knew something was wrong. I couldn’t feel my arm anymore, so I went to the trainer,” Spence said. Spence is not as fortunate as his teammate. Unlike Myrick, he will not be able to play in the homecoming game or any other game this season. “You feel like you are letting your team down a little bit, but you always have to be there to support and make sure they have a good attitude going into the game,” Spence said in regards to being on the sidelines for the game. The fracture is at the top of Spence’s arm, but he is expected to make a full recovery with no surgery needed. He will be ready for his senior year of high school football next season. On the opposite side, West varsity football is facing no major injuries. “We actually are all healthy!” senior Ethan Swanson said. Spence and Myrick were both lucky with their injuries in the sense that they are both juniors with injuries that will be quick to heal. In the past, other West Bend players have not been so lucky. Nick Reimer, who graduated from last year, remembers what it was like to miss the majority of his final homecoming game due to injury. Reimer had a recurring knee injury, and early in the season he dislocated his knee which caused a near ligament tear. He knew what this could mean for his final homecoming game. “At first, I was really upset about not being able to play in my last homecoming game knowing it was the biggest game of the year and a lot of people would be watching. If it had been up to me, I would have held out on the surgery until after the year so I could play. I am really happy I didn’t though because I would have probably injured it more,” Reimer said. Reimer accepted the fact that his senior season of football had come to an early end. East ended up taking home the coveted bucket when they dominated West, 46-6. Reimer remembers watching that game. “I was really happy that our team pulled out the victory. It was very difficult to watch and not be out there with the guys, but watching them succeed was very exciting for me. I had played with a lot of them since fifth grade, and I was glad I was still part of the team,” he said. Reimer had a lateral ligament reconstruction with lateral release to fix his knee injury. He is now a freshman at UW-Lacrosse and is pursuing a career as a physical therapist. His knee recovered nicely, and he was able to participate in his final season of baseball at East. Even though a football team contains a large number of players, one injury can be devastating to a team. “You can lose some of the best players. Collectively, if there are a lot of injuries, it can take away a lot of talent from the team,” Spence said, reflecting on team injuries. How will these injuries affect East in this year’s homecoming game? Will Myrick play despite his broken finger? Find out by attending the game Friday at 7 p.m. in the football stadium.